Added May 20, 2015: Oakland Community Meeting for Proposed Bike Share Street Network, Monday, June 1, 2015. Find out more details here. Pittsburgh Bike Share owns and operates the Healthy Ride bike-sharing system as the primary extension of our commitment to increasing public transportation options in the city. Pittsburgh Bike Share is dedicated to creating a ubiquitous active transportation network that positions human powered transportation as an integral part of the larger public transit system in the city of Pittsburgh. In 2013 Bike Pittsburgh raised significant capital from local foundations–including Heinz Endowments, Buhl Foundation, Henry L. Hillman Foundation, Richard King Mellon Foundation, and other anonymous donors–to cover planning and capital costs and match a $1.6 million Congestion Mitigation and Air Quality improvement (CMAQ) grant from the Federal Highway Administration. This successful fundraising campaign launched the bike share project. Bike Pittsburgh, working alongside leaders at the Department of City Planning, hired Alta Planning + Design to develop a business plan for the program. Alta Planning + Design, in partnership with the City of Pittsburgh Department of City Planning, conducted a thorough community outreach and planning operation and completed the business plan in 2013. In 2014, the City advertised a bid for bike share procurement and system installation. The bid was awarded to S.E.T., an Ohio based general contractor, partnering with Nextbike, a German company with over 20,000 bicycles deployed in bike-share systems worldwide, to provide the system equipment, including GPS enabled bicycles, solar powered kiosks and docking stations, and software to operate the system. As mandated by Pennsylvania Department of Transportation and the CMAQ grant requirement, the City of Pittsburgh contracted with a federally certified project management team, CDR Maguire, to manage the implementation. Pittsburgh Bike Share is continuing to secure additional community, corporate, and philanthropic support, most recently enlisting the Colcom Foundation as a funding partner. 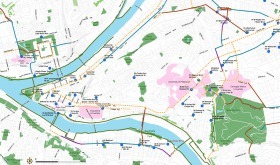 In February 2015 Pittsburgh Bike Share hired David White as the executive director and will begin preparing to locate the operations center in the 3300 block of Penn Ave. in the Spring of 2015. By the end of our first year of operations, we will be working with community leaders to expand the bike share network and increase density of stations in existing neighborhoods. Continue to check the Pittsburgh Bike Share website for planning updates.